I was sitting at the study table in my hotel room, trying to write something down as a reflection of my trip to Iran on the morning of my departure out of Shiraz to Dubai. Suddenly, there was this loud bang which somehow sounded like a cross between a storm and some construction work. I thought there could be some demolition work next door because it sounded so close, so much so I _thought_ I felt the hotel building swaying a few times. The table moved. The chair I was sitting on, slid on the floor further away from the table. Even the double bed moved. I thought, “Wow! They must be bringing the building next door down”. That lasted for a few seconds but long enough for me to “instinctively” grab hold of the table lest the chair I was sitting on move further away from the table. “Could this be an earthquake?” But no one was running out of their room. No one was screaming. There’s no commotion whatsoever whether in the corridor outside of the room or on the road outside of the hotel. Everything seemed to be quiet and peaceful. Feeling a bit dizzy yet curious, I opened the door to my room thinking maybe I should check with the reception. I went downstairs but not before wondering if I should take the stairs or the elevator down. From the sound of it, the elevator seemed to work so I took the elevator. Downstairs, I saw that it was business as usual in the hotel lobby. I must have been dreaming then. Or worse, hallucinating, I thought. Afterwards, I went out of the hotel to do some last minute walk around the city centre to buy some local delicacies to bring home. All shops were opened as usual. So yeah, it couldn’t really be an earthquake, could it? 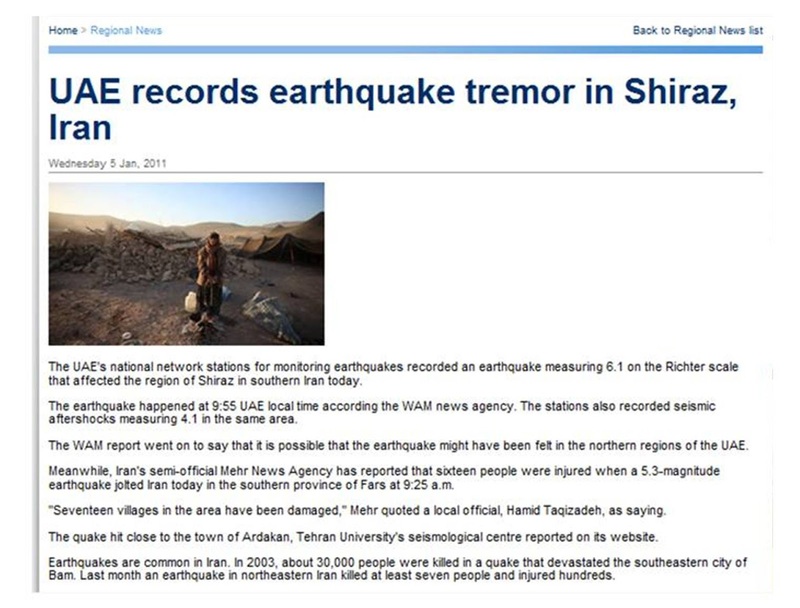 News about the earthquake as reported by 7Days, a tabloid in the UAE, which I found out when I landed in Dubai. If you are outside, move away from power lines, trees and buildings. If you are inside, stay away from windows, mirrors cupboards, and shelves. Take cover under a sturdy table or desk. Hold on to it. You can also stand under a doorway, they are one of the strongest foundations of a house. Be prepared for possible shaking after the main quake. If you are in a high building, stay out of the elevators and stairways. A family can prepare for an earthquake by having flashlights, helmets and sturdy shoes, a first aid kit, a fire extinguisher, bottled water, canned food and a can opener. 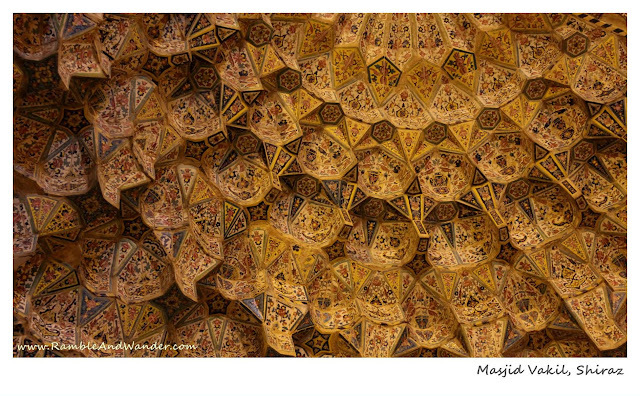 For other blog entries on Iran, click here. But wouldn't it be too late then? ;-) There have been reports about tremors affecting the west coast of Peninsular Malaysia everytime there's an earthquake somewhere in Indonesia. It can be quite scary at times. Even here in Dubai, those who work/ stay in highrise buildings can sometimes feel the tremors whenever there's an earthquake in Iran. Yup, that's the thing. We didn't expect it to be an earthquake. We just thought that we're either feeling dizzy or a bit disoriented. Just goes on to show how we're totally inexperienced and unprepared if such a calamity happens, nauzu biLlah. i tak nak komen boleh? hehehehhe.... anyway, luckily u r ok else we would be lost without RAW in twitterland. fridge magnet dubai satu pls.. lol..
Takut mereka fikir saya gila kerana mereka berbuat kayak ga ada apa-apa yg berlaku, hehe!